Ever thought about becoming a gelato entrepreneur? Then, you’re covered: in Anzola dell’Emilia, a small town near Bologna, Carpigiani Gelato University teaches the art of artisan gelato. And if the idea of a university for gelato seems exaggerated, think again: making the perfect gelato and becoming a successful gelatiere are no easy tasks. First and foremost, you need to learn how to mix the different ingredients and to follow a rigorous productive cycle to obtain the right balance of flavor and texture: the perfect gelato. But that isn’t enough: the successful gelatiere also knows marketing, management and design, so he can sell gelato and market it in the right way. 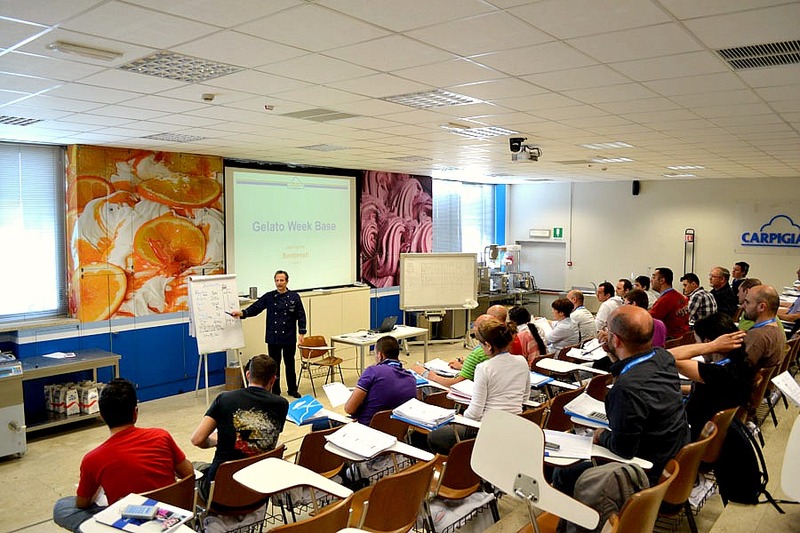 This is what Carpigiani Gelato University aims to teach its students. 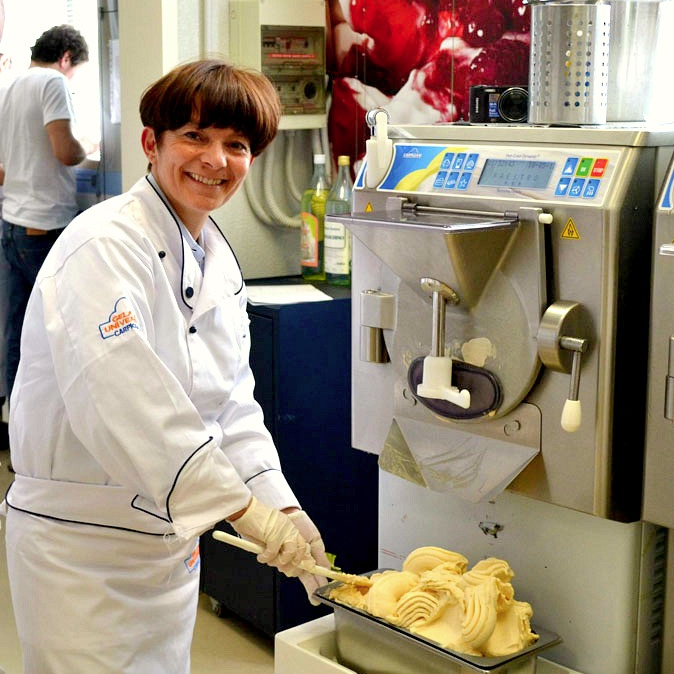 Carpigiani Gelato University was founded in 2003 by Carpigiani, one of the biggest producers worldwide of gelato-making machines. The university’s mission is to make artisan gelato known and appreciated all over the world by teaching aspiring gelatieri the art and craft of artisan gelato, one of the many culinary prides of Italy. Interestingly enough, enrollments at the school have doubled since the beginning of the economic crisis in 2008. Having a gelateria can be a fruitful business: while 1 kg of gelato costs around €2 to make, it is sold at €15-18/kg, and the initial investment is relatively low, at roughly €100,000. Moreover, the market for artisan gelato is big: except for Italy, where artisan gelato stands at 60% of the market compared to 40% of industrial ice-cream, abroad, artisan gelato covers only 2% of the market. Half of the students at CGU are in fact foreign (courses are taught in different languages, including English). Another interesting aspect is that the average age of the students is 35-40: many begin the four- week course because they have decided they want to completely change their lives. They have a regular job, but are dissatisfied with it; sometimes they want to move to another country. 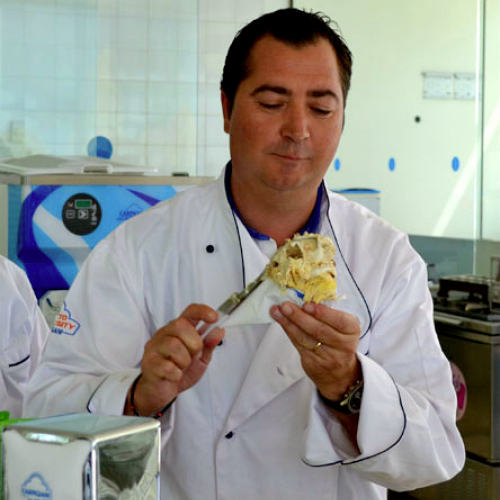 Like Ferruccio Rivolta, a 42-year-old man from Milan, married with a child, who has plans to close his own company in the transportation sector to open his gelato business in Doha, the capital of Qatar. Or like Raffaela Del Pastro, from Belluno, who fell in love with gelato in – as strange as it may sound – Germany, where she was employed at a gelateria managed by fellow Italians. Working there, she says, made her so passionate about the process of making gelato that she decided to enroll at CGU. She dreams of opening her gelato parlor in South Africa, but she’ll probably opt for Australia instead where she already has some family members. The ingredients used to make gelato – water, milk, eggs, cream, sugar, cocoa, fruit and more – determine its high nutritional value. Those ingredients provide proteins, carbohydrates, fats, vitamins and minerals, making gelato a wholesome food. Milk provides high-quality proteins and calcium; lactose and saccharose, the sugars used in gelato, provide a good source of energy, as do fats. Gelato also contains vitamins A and B2, as well as phosphorus. Gelato has a better nutritional intake than a sandwich (hint for what to eat on your next lunch break). The importance of gelato as a healthy and all-around food is such that the University of Bologna, in collaboration with Carpigiani Gelato University, has established a one-week course granting college credits that focuses on the beneficial effects of gelato on our health, both of the body and mind. So, next time you eat gelato, don’t feel guilty! Gelato and ice-cream: learn the difference! The general English translation for gelato is ice-cream, which makes no distinction between industrial ice-cream and fresh ice-cream. However, there are important differences between the two: gelato is less fat and contain less air than ice-cream and it’s served at a higher temperature. These factors give gelato a much richer taste than ice-cream. In addition, gelato offers a wider variety of flavors compared to ice-cream; also, gelato is made in smaller quantities, as it never uses the long-life ingredients that industrial ice-cream, produced in large quantities for supermarkets, employs. That’s why artisan gelato is synonym with freshness. Besides, because it’s artisanal, it can be easily adapted to the different tastes and preferences of the different populations simply by diversifying ingredients and flavorings. Now that you know the difference, you should never call ice-cream what is in fact gelato! Don’t miss: Gelato Museum Carpigiani! The first museum dedicated to the history, culture and technology of artisan gelato is scheduled to open on September 27, 2012 in Anzola dell’Emilia (Bologna). Not to miss for all true gelato fans!